About a billion years before the dinosaurs became extinct, stromatolites roamed the Earth until they mysteriously disappeared. Well, not roamed exactly. Stromatolites (“layered rocks”) are rocky structures made by photosynthetic cyanobacteria. 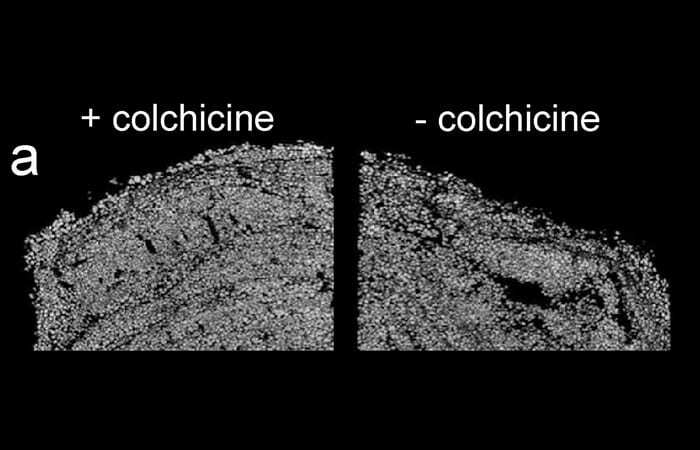 The microbes secrete sticky compounds that bind together sediment grains, creating a mineral “microfabric” that accumulates in fine layers. Massive formations of stromatolites showed up along shorelines all over the world about 3.5 billion years ago. 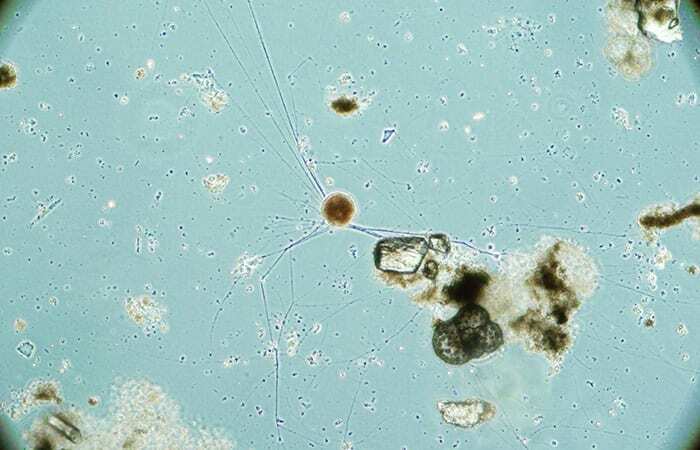 They were the earliest visible manifestation of life on Earth and dominated the scene for more than two billion years. Why they declined has remained an unsolved puzzle. But in a study published May 28, 2013, in Proceedings of the National Academy of Sciences, WHOI researchers identified a possible reason for the crash by re-creating the evolutionary event in the laboratory. 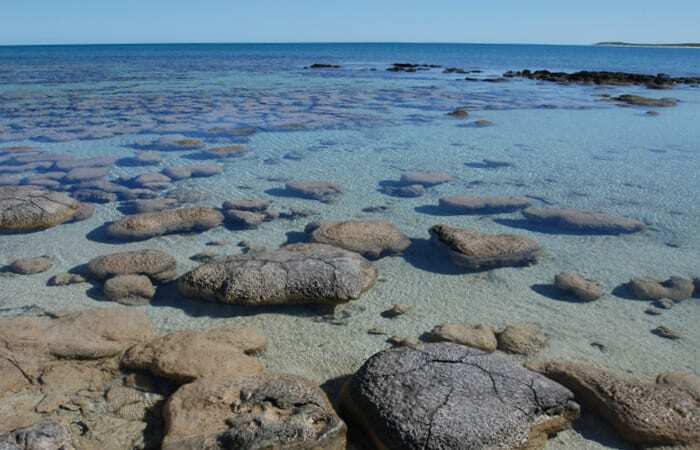 One clue to the mystery was that the disappearance of stromatolites coincided with the sudden appearance in the fossil record of different formations called thrombolites (“clotted stones”). Thrombolites are also produced by microbes, but they are clumpy, rather than finely layered. Were the rise and fall of the two kinds of formations related? Did stromatolites become thrombolites, and if so, why? 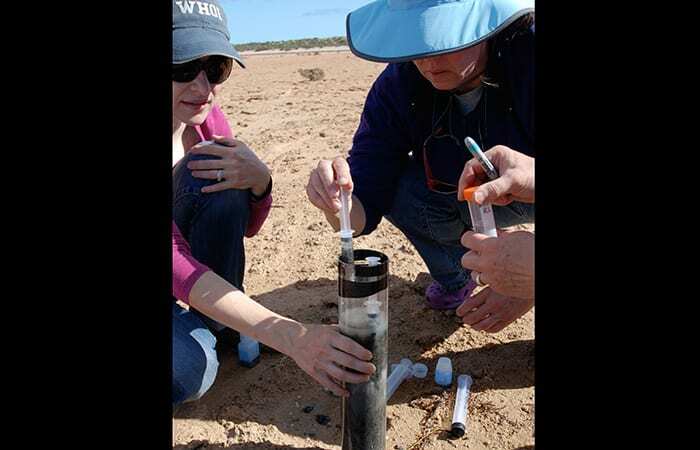 “It’s one of the major questions in Earth history,” said WHOI microbial ecologist Virginia Edgcomb. Bernhard and Edgcomb suspected that another organism may have played a decisive role: foraminifera, or “forams” as scientists often call them. Forams are protists, the kingdom that includes amoeba, ciliates, and other single-celled organisms. Forams are abundant in present-day ocean sediments, where they use fingerlike extensions called pseudopods to engulf prey and to explore their surroundings. In the process, their pseudopods churn the sediments on a microscopic scale. Living stromatolites can still be found today, in limited and widely scattered locales, as if a few velociraptors still roamed in remote valleys. Bernhard, Edgcomb, and colleagues looked for foraminifera in living stromatolite and thrombolite formations from Highborne Cay in the Bahamas. Using microscope and RNA sequencing techniques, they found forams in both—and thrombolites were especially rich in the kinds of forams that were probably the first foraminifera to evolve on Earth. Next, Bernhard, Edgcomb, and WHOI postdoctoral investigator Anna McIntyre-Wressnig created a lab experiment that mimicked the conditions that might have prevailed a billion years ago. They started with modern stromatolites and added the kinds of forams that are found in thrombolites. Some samples were also treated with a drug that prevented the forams from sending out pseudopods. After about six months, they examined the formations. 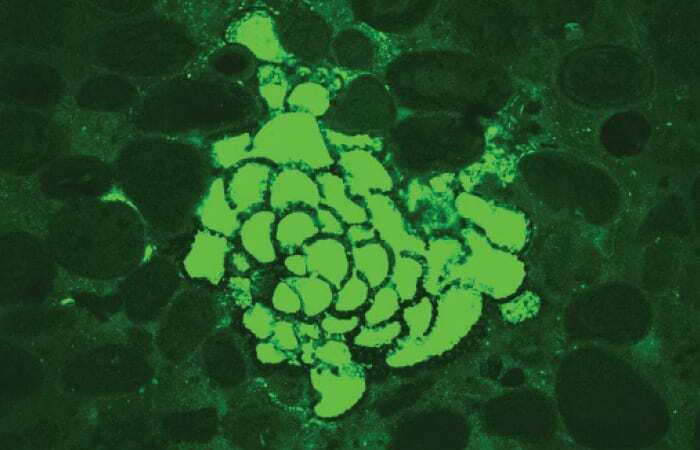 In drug-free samples, where forams could use pseudopods, the fine layers had changed to jumbled arrangements similar to those seen in thrombolites. In drugged samples, where the forams were immobilized, the fine layers remained intact. 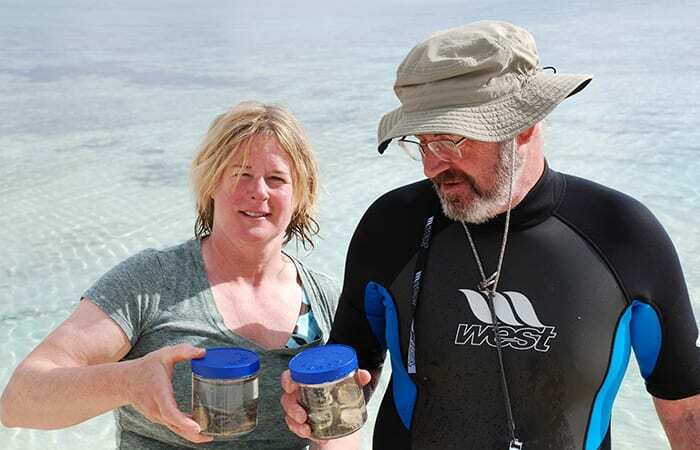 Bernhard and her colleagues concluded that active foraminifera can profoundly alter the structure of stromatolites—perhaps enough to have spurred a major evolutionary change. This research was funded by the National Science Foundation. A pair of micro-CT scans of stromatolites that had been seeded with thecate foraminifera six months prior. The sample on the left had been treated with colchicine to prevent the foraminifera from developing pseudopods. The fine layers of sediment characteristic of stromatolites can be seen near the top of the sample. In the sample on the right, the foraminifera were allowed to make pseudopods. The fine structure of the sample has become clumpy and jumbled.